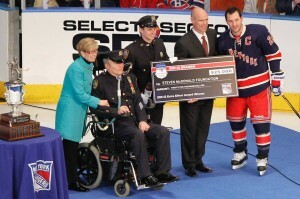 Which NY Ranger’s Extra Effort Will Get the Steven McDonald Award? On July 12, 1986, New York City Police Officer Steven McDonald was shot 3 times while investigating bicycle thefts in Central Park. The shooting left him a quadriplegic, but this true hero (and lifelong New York Rangers fan) has remained a proud member of the NYPD. He has turned the tragedy of that day into triumph, has started his own charitable foundation, and has become a public speaker for the cause of curbing gun violence. Following the 1987-88 season, the New York Rangers established the Steven McDonald Extra Effort Award. 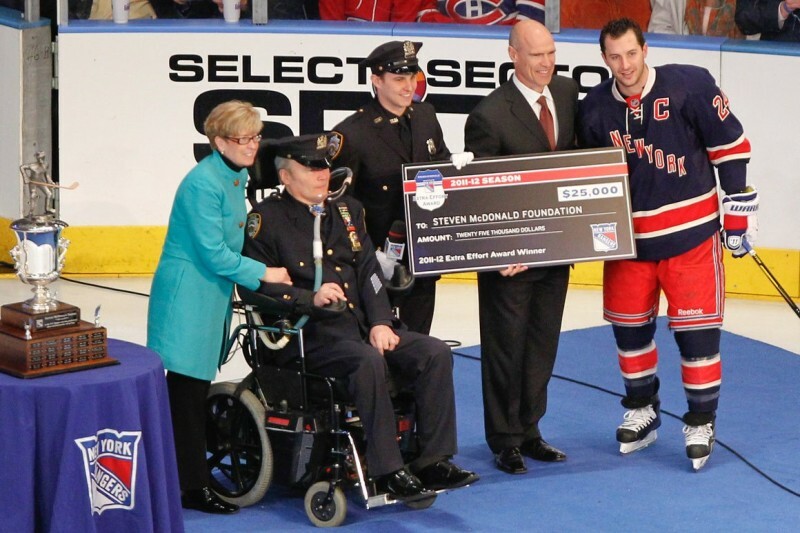 Rangers fans vote for the player who “goes above and beyond the call of duty” during the season, and the winner is presented with a trophy and a $25,000 check in their name made out to the Steven McDonald Foundation. Former captain Ryan Callahan has won the award four out of the past five years, but now that he has been traded to the Tampa Bay Lightning, the torch will have to be passed on to another Blueshirt. So who will it be? We’ll try to break down the possibilities and give our best guess as to this year’s Extra Effort Award winner. Our first tier contains the prohibitive favorites. There are no surprises here–as each one of these players has gone above and beyond the call of duty over and over again, and all of them provide the extra effort needed to make their mark. King Henrik always has to be considered as one of the favorites. He has defined “extra effort” over his career with the Rangers, in many cases carrying the team on his back as they floundered both offensively and defensively. He is also the only current Ranger who has previously won the award–taking the honor in the 2005-06 campaign (his first year with the team). While this year started out very slowly for Henrik, he has regained his form with a vengeance. 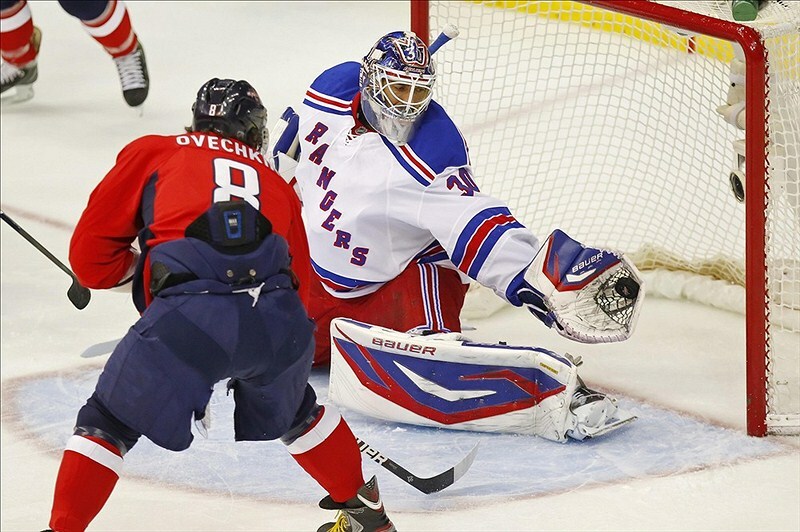 In doing so, he’s eclipsed the 300-win mark, and set new Rangers franchise records for career wins and shutouts. With all that going for him, it’s going to be hard to bet against the King. 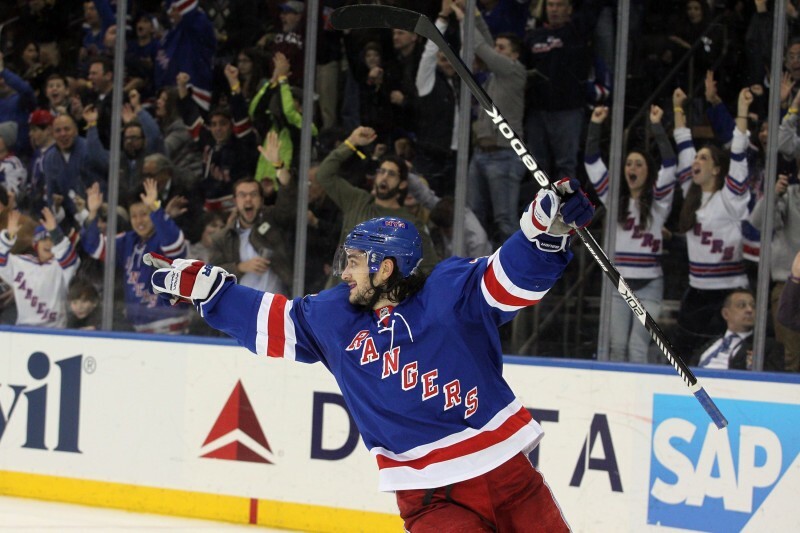 If there’s a Ranger who has lived and breathed extra effort this year, it’s Zuccarello. Officially the smallest player on the roster at 5’7″, the Norwegian-born winger known as “The Hobbit” has shown the biggest heart. He has provided consistent offense and hustle after experiencing his own slow start. He has the most points on the Rangers with 55, despite missing two weeks immediately after the Olympic break with a broken hand. It’s amazing to think that at the beginning of the year, he was struggling enough that coach Alain Vigneault held him out of the October 24 game against the Philadelphia Flyers as a healthy scratch. Since then, the Hobbit has been absolutely on fire–playing a fearless game that earns him a place as a fan favorite and a top spot in the race for the Steven McDonald Award. 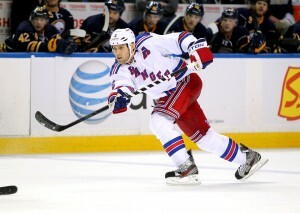 Next on our list of top picks is first pair defenseman Ryan McDonagh. McDonagh leads the Rangers in minutes played per game with an average of 24.6, and a majority of those minutes come against the other teams’ top forwards. McDonagh has been quietly putting together better and better seasons since coming over from the Montreal Canadiens in the Scott Gomez trade. This year, he leads all Rangers blueliners in points with 43, which also ties him for 4th place overall on the team. His name is even coming up as a potential Norris Trophy candidate. His upside is enormous, and at only 26 years of age, he stands to get even better. If we are making a case for Ryan McDonagh, we must also include his defense partner, alternate captain Dan Girardi, in the list. He also plays consistently against opposing teams’ top lines. Girardi leads the team in hits by a large margin with 187. His leadership has earned him the “A” on his jersey, and he’s considered one of the front runners for the currently vacant captaincy. His gritty game is a perfect fit for the Extra Effort Award–he deserves, and will get, a ton of votes. While the favorites seem to have an edge, they are by no means the only choices this year. We could see some other players make a run at the award, and though they face longer odds, count them out at your own risk. There is no player on the Rangers roster quite like Chris Kreider. Playing his first full NHL season since breaking into the league with a bang during the 2012-13 playoffs, Kreider quite simply has breakout speed and quickness combined with size. While teammate Carl Hagelin has higher top-end speed, there is nobody on this Rangers team that gets up to full speed quicker than Kreider. Kreider has been out since March 26, and has undergone surgery on his left hand. His injury will keep him out for the remainder of the regular season, and likely the first round of the playoffs as well. In spite of this, he’s still tied for fourth on the team in goals with 17 and is second on the Rangers in hits with 146. He uses his amazing quickness, strength, size and top-notch hockey sense to create opportunities nearly every shift. His shortened season may drop him down on the list this year, but he will be a front runner for many years to come. To get a sense of just how powerful Kreider’s legs are, here’s the video of him jumping out of a swimming pool that made him an internet sensation. With this kind of explosive strength, it’s no wonder he can out-accelerate people seemingly at will. Rick Nash is finally in the conversation for this award. He leads the team in goals with 25, and looks to have overcome his injuries from last year and the beginning of this year. He is finally using his size to create opportunities, not only for himself, but for his linemates. While he’s been a force this year, it’s still hard to categorize his game as having extra effort. He’s expected to lead the team, and to be the top scorer–so in order for him to go “above and beyond the call of duty”, he needs to put together a truly exceptional year. It’s going to happen sooner or later. A case could be made for any player on this list–and for many others that haven’t been mentioned. But of course, there can be only one–usually. The award was actually shared by John Vanbiesbrouck and Kelly Kisio during the 1989-90 season. While we’re not predicting a tie this year, the vote will be close. 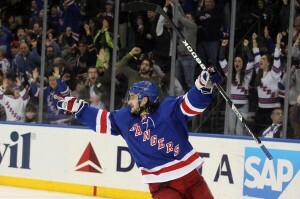 Anyone here would be a great choice, but we’re predicting that Mats Zuccarello will walk off with the award this year. The Norwegian Hobbit has been absolutely huge for the Rangers, and hard as it is to argue against Henrik Lundqvist’s record-breaking season, Zuccarello has been the epitome of extra effort every time he’s been on the ice.